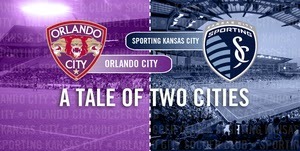 LAKE BUENA VISTA, Fla. — With weeks left in preseason, Orlando City SC’s roster looks to increase with a few new players, meaning the Lions will be awaiting on the arrival of the two Sporting Kansas City players that will be loaned to Orlando for the upcoming 2014 USL Pro season. Since affiliating with the MLS club last year, Sporting KC sent four players on-loan during the 2013 USL Pro season, and it paid big dividends for the Lions and players as well. Initially, Sporting sent forward Dom Dwyer, midfielder Christian Duke, defender Yann Songo’o and goalkeeper Jon Kempin to Orlando City last year, though Dwyer’s well-form was convincing to earn him a call-up to Kansas City during the middle of the USL Pro season. Kevin Ellis, CJ Sapong were the two other Sporting KC loanees that joined the Lions during the latter part of the USL Pro season, mainly because of Dwyer’s return to Kansas City and Songo’o’s release from the club. With Sporting KC also affiliating themselves with incoming USL Pro club Oklahoma City Energy, Vermes will have to divide the four players, meaning the Lions and Energy will each receive two players on loan for the upcoming season. Stay tuned with the OSJ for the latest players transactions in Orlando City.